Mathematicians at UC Davis have come up with a new way to crinkle up the fabric of space-time -- at least in theory. 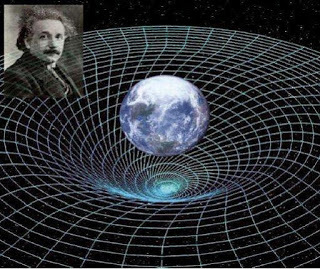 The results are reported in two papers by Temple with graduate students Moritz Reintjes and Zeke Vogler, respectively, both published in the journal Proceedings of the Royal Society A.
Einstein's theory of general relativity explains gravity as a curvature in space-time. But the theory starts from the assumption that any local patch of space-time looks flat, Temple said. Temple and his collaborators study the mathematics of how shockwaves in a perfect fluid can affect the curvature of space-time in general relativity. In earlier work, Temple and collaborator Joel Smoller, Lamberto Cesari professor of mathematics at the University of Michigan, produced a model for the biggest shockwave of all, created from the Big Bang when the universe burst into existence. A shockwave creates an abrupt change, or discontinuity, in the pressure and density of a fluid, and this creates a jump in the curvature. But it has been known since the 1960s that the jump in curvature created by a single shock wave is not enough to rule out the locally flat nature of space-time. Vogler's doctoral work used mathematics to simulate two shockwaves colliding, while Reintjes followed up with an analysis of the equations that describe what happens when shockwaves cross. He found this created a new type of singularity, which he dubbed a "regularity singularity." Temple and his colleagues are investigating whether the steep gradients in the space-time fabric at a regularity singularity could create any effects that are measurable in the real world. For example, they wonder whether they might produce gravity waves, Temple said. General relativity predicts that these are produced, for example, by the collision of massive objects like black holes, but they have not yet been observed in nature. Regularity singularities could also be formed within stars as shockwaves pass within them, the researchers theorize. Reintjes, now a postdoctoral scholar at the University of Regensburg, Germany presented the work at the International Congress on Hyperbolic Problems in Padua, in June.